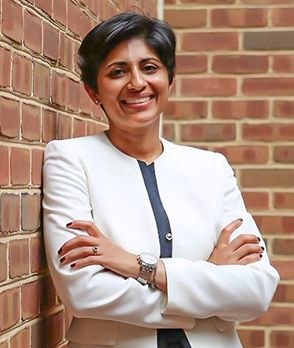 Dipti Pidikiti-Smith, Director of Advocacy at Legal Services of Northern Virginia, is the recipient of the Legal Aid Award honoring excellence in legal aid society work. The award recognized those who exhibit: 1) Innovation and creativity in advocacy; 2) experience and excellence in service; and 3) Impact beyond his or her own program's service area. Pidikiti-Smith began her legal career at LSNV in 2008 as a staff attorney and had various roles including, Senior Staff Attorney and Chair of the Housing Law and Consumer Law Units. Dipti is an Adjunct Professor at the University of the District of Columbia – David A. Clarke School of Law. Prior to joining LSNV, Dipti served as a law clerk at the District of Columbia Superior Court for Judge Russell Canan and Judge Stephanie Duncan-Peters. Dipti worked for AmeriCorps at the Commodore Barry Elementary School in West Philadelphia. In 2000, she received a Service Award from the City of Philadelphia Police Athletic League. In 2006, she was awarded the Charles Hamilton Houston Scholarship by the Washington Bar Association Legal Fund and the Service Award from the University of the District of Columbia, David A. Clarke School of Law. She was awarded the 2012 Lassy Award from the Virginia Poverty Law Center for greatest achievement in housing law and the 2015 Lassy Award from the Virginia Poverty Law Center for the greatest achievement in consumer law. In 2016, she was recognized by the City of Alexandria Chamber of Commerce as one of its “40 under 40 Emerging Leaders” and by VA Lawyer’s Weekly as an “Up & Coming Leader in the Law” in Virginia. Pidikiti-Smith is a member of a number of legal associations including the Alexandria Bar Association where she currently serves as president, the Virginia State Bar Diversity Conference, and the Virginia Trial Lawyers Association – Diversity Committee. She served on the City of Alexandria Economic Opportunities Commission from 2011-2016, serving as chair during the 2014-2015 term. Currently, Pidikiti-Smith serves on the Fairfax County Community Action Advisory Board and on the board of the Alliance for Human Services in Fairfax County. She graduated from Temple University with a Bachelor’s of Science in Biology and the University of the District of Columbia David A. Clarke School of Law. Pidikiti-Smith was born in India and spent her early childhood in India and Nigeria. After arriving in the United States, she resided in Philadelphia. She now lives in Fairfax with her husband, son, mother, and two cats. Pidikiti-Smith will receive the award on June 15 at the Virginia State Bar Annual Meeting in Virginia Beach.